DRIPPING SPRINGS, TX — Gary Hale had no idea the value of a car he bought for $500 when he came back to Texas from serving in Vietnam in 1970. “There was no chrome on it. No emblem on the front. The steering wheel was different,” said Hale. The veteran drove the car a few times before putting in the garage where it remained untouched for 43 years. “It was like opening a tomb you know. The funny part is Gary [Hale] had no idea the value of the car and Bobby and I both with, ‘Oh my God, that’s a ’55 Corvette! '” said Bama Brown. 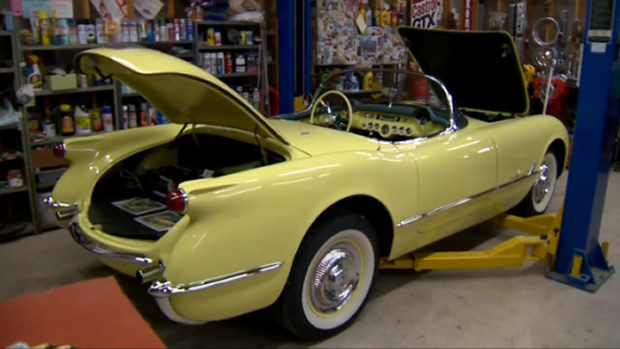 Brown is a KVET radio personality, who along with two of his neighbors and friends, volunteered their own time on weekends and nights to restore the 1955 Corvette back to original luster. “It’s a piece of art. It’s an old-timer car, and it’s well worth all our efforts,” said Lee Reed, a friend and neighbor who helped in the Vette restoration. Brown, Reed and another buddy, Bobby Maxa, spent 15 months on the car redoing everything from the transmission to the tail lights.